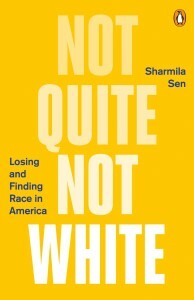 Sharmila Sen’s Not Quite Not White is articulate and engaging, so it’s all the more unfortunate that it fails to draw meaningful, practical conclusions about America’s imperfections. In this memoir/manifesto of a first-generation immigrant from India, Sen delivers a fascinating slice of culture and perspective, but preaches to the established choir in a manner unlikely to win new converts. Those outside Sen’s proverbial church, may nonetheless find Not Quite to be an interesting pulse-check on the current progress of the cultural conversations in America. Regardless, it fails in the tradition of Between the World and Me in its lack of a constructive vision for how things could improve. Sen extensively indicts the seemingly problematic ways immigrants are required to assimilate, and this represents fruitless wishful thinking without ever articulating what those wishes are. Such wheel-spinning reveals Sen’s ultimate crusade as rooted in her own neuroses; the curious twist is that these insecurities were born and cultivated in a country that isn’t America. Sen resided in India from birth until age 12, at which point her family emigrated to Cambridge, Massachusetts. The premise of this book’s subtitle, Losing and Finding Race in America, relies on the idea that race is something she didn’t have in India, that it was only assigned to her on a paper form upon entry to the USA. She finds troubling the lack of precision in the way immigrant intake forms classify race. On the surface, this would suggest that during her childhood in India she was able to live as the purest expression of herself, then only upon entering America did people start applying stereotypical labels and expectations. The first person account of Sen’s childhood in India quickly shows this not to be the case at all. It details the varying number of superficial ways people are judged and categorized in India, based on caste, clothing, religion, skin tone, and geographic region. Each subdivision holds negative stereotypes about members of the opposing tribe, each believing itself to be superior. To be sure, these harsh classification systems are largely unfair, especially so for a young child unequipped to establish her own identity beyond the box she was born into. The problem is that Sen lives through 12 years of this hyper-analyzed cultural classification, develops a metaphorical post traumatic stress disorder, carries it across the Atlantic, then projects it onto her American contemporaries unfairly. We often tell insecure teenagers that people are far too busy thinking about themselves to bother thinking about you; this advice is lost on Sen who, at time of publication, approaches 50 years of age. The book undoubtedly contains moments representing legitimately reprehensible American behavior. In one, her middle school teacher takes the class to see the movie Gandhi, after which her classmates exaggerate the Indian accent in her presence as a running joke. In adulthood, having attained a position as a university professor, a colleague bluntly suggests she was a diversity hire, effectively having stolen the position from a more qualified candidate. While these behaviors are unacceptable, they really only indicate the immaturity of adolescents, and a racially tone-deaf adult who hardly represents the norm. Using these incidents to portray the United States on the whole, is misrepresentative cherry-picking. Much of the rest of Sen’s racial ponderings are heavily semantic and suffocatingly overanalyzed. The racial dissonance she chronicles is largely a product of the oversimplified race categories on immigrant and census forms, rather than any tangible way that different racial groups are treated and perceived in reality. By diving so deep into racial semantics, etymology and history, the author gets so heavily engrossed in overanalysis that she could eventually draw any conclusion that suits her thesis. She’s looking to cash a seemingly blank check that readers should pause before signing. Growing into her American citizenship, the author documents her exhaustive efforts to assimilate, a verb she fetishizes long past its usefulness. Wanting to Americanize her accent to avoid sounding noticeably foreign, she rushes home after school each day to watch American television programs, studying and practicing the pronunciations of sitcom characters. She and her entire family also bend over backward to adopt a new culinary repertoire that blends in with standard white behavior, lest they “stink of curry,” another phrase the author awkwardly employs far more times than is necessary. Sen recalls with embarrassment the ways her family attempted to put together new dishes using info obtained from Campbell’s soup labels, having no real idea what they were doing. The basic facts of these narratives could have just as easily been presented as a farcical look back, a humorous coming of age meditation, a family trying to make it the best way they knew how without a cultural roadmap. Instead these anecdotes are presented with insufferably smug resentment. Sen can’t acknowledge that her family freely elected to move to a foreign country; after their own tumultuous slide from riches to rags, they decided India didn’t offer the economic opportunity they felt they were due. She ignores the reality that her self-suffocating immersion into American food and media is entirely an endeavor of her own initiation. Most troublingly, by portraying her cultural re-education efforts this manner, she in turn denies herself the majority of her own agency. The subtext of Sen’s grievances are a dissatisfaction with a country in which people don’t understand or participate in all languages, cuisines and movies with equal measure. The reality is, for a multitude of reasons—some tragic, some practical, all real—this just isn’t how it works. She wistfully regrets that upon migration to the states, her vibrant linguistic world of the Bengali language was reduced to their tiny attic apartment. If only Sen’s editor had the bravery to remind her that this scenario would play out the same in virtually any other country. The fatal flaw of Not Quite Not White is that the target of its attack, the white privileged majority, are trapped in a catch-22 in which they can do no right. Sen condemns white America of marginalizing ethnic groups in one breath, then accuses them of appropriation in the next. For example, she recounts her collegiate participation in a show displaying an array of Indian style dances, complete with authentic outfits and gyrations. During her freshman year, the scene was a fairly marginal niche, with Sen whining that few white students spectated or participated. By her senior year, the shows came to draw the kinds of numbers she had yearned for—but she has mixed feelings about it. She grew uncomfortable with the expanding audience, worried that whites couldn’t understand what they were watching, unable to distinguish between the current popular culture of the India she had lived in, versus a novel relic of an ancient civilization. In this calculation, the American majority is first heartless to ignore it, then unqualified to embrace it. As far as a middle ground that might reconcile the two extremes, Sen never answers the question, What would that look like? This failure speaks volumes about her perpetual unwarranted insecurity, and is grounds to dismiss her thesis without further ado. This thought pattern could be afforded the benefit of the doubt as a one-off, but these contradictions permeate the entire work. Sen paints a resentful portrait of the entitled American explorer, frequently found in Ivy League communities. These entitled explorers have a hunger to discover all things in the world that can be seen, eaten, photographed, analyzed, and discussed in its array of dialects. Sen scorns them for self-identifying as forward-thinking liberals, for taking pride in their adventurous palates and decorating their house with souvenirs from their varied journeys. These Americans are genuinely interested in exploring and embracing cultures and viewpoints far beyond their own neighborhood, but in her myopia Sen only perceives people who conquer and steal. Amazingly, just a few dozen pages later, she’s horrified by what American schools have taught her elementary school son: that the American immigrant story is heroic and transcendent, that Ellis Island is a beacon of perfection that the remainder of the world could only hope to aspire. As a result he’s taken aback by the idea that he might ever have to go live in another country, since he’s been brainwashed to think that everything you could ever need is available in the gold-paved streets of the USA. Sen shames the American education system for failing to prepare its students for the possibility that they may move elsewhere to experience new and exotic languages, foods and lifestyles. She is blind to the obvious connection: The students that are taught to have a curiosity beyond their own borders, would be those same conniving entitled explorers she chastised thirty pages ago. As before, if it were possible for a white person to embrace and explore other cultures in a way that wasn’t problematic, Sen willfully avoids answering the question, What would that look like? In moments like these she reveals herself to be genuinely confused. For anyone to take her statements seriously, she should at least afford her audience some consistency. While it’s easy enough to write off some of Sen’s overreaching indictments as stemming from genuinely misguided neuroses, they sometimes step into domains too problematic to laugh off in stride. In one unnecessary moment she compares herself to the enlightened Buddha, since she at a much earlier age than he, witnessed the gruesome human suffering and decay necessary for full enlightenment. Later on she claims her family’s move to America is somehow worth considering in parallel to slaves’ journey to the New World. Keep in mind, Sen’s family was extremely wealthy, gradually slid into misfortune, then traveled to America for what eventually became a successful second act. Drawing comparison between her own narrative and that of imported slaves, reveals the shockingly tone-deaf depths of her persecution complex. For that matter, Sen takes the phrase “person of color” to task, explicitly stating that she doesn’t want her children to be known as people of color because she wants more for them. A great many Americans, immigrants or otherwise, embrace that term as an affirmation rather than a negation. In turn, Sen’s aspirations for her children, unnecessarily muddled in racial semantics, are troublingly misguided at best and condescendingly offensive at worst. The saddest part of Sen’s life chronicle is that we scarcely learn about who she actually is. She spends so much time defining the evolution of her identity in terms of superficial factors—clothes, food, money—that she never gets around to figuring out the person she wants to be from within. She could obtain some real peace of mind if she defined her life experiences in terms of presence, rather than dwelling on absence. That her life manifesto’s title Not Quite Not White contains two negatives, speaks volumes about the lose-lose mentality to which she is resigned. America is a country with vast room for improvement in the way it accepts and cooperates with a vast variety of cultures. But to hold America to task to the extent that Sen wants, would be as absurd as it would be counterproductive.